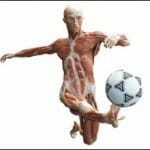 “The Soccer Player” – one of the figures now on display at the “Body Worlds” exhibit at the Portland Science Center. On Sept. 30th, 2015 students from all three NTI’s campuses will be congregating at the Portland Science Center to experience the facets of the human body in a way they have never seen before. They will be attending the Body Worlds exhibit, which displays real human specimens, preserved through a process called Plastination. The cadavers, as artistic as they are positioned, are designed to not only entertain, but to teach students by displaying inner human Anatomy as well as the effect of disease on the human body. The NTI staff is excited to offer this unique opportunity as a valuable interactive experience, bringing text based concepts to life. They say that ‘Seeing is believing’ but seeing is also memorable. By implementing the exhibit’s educational syllabus and visualization of real human anatomy, NTI hopes to give their students an educational experience that they will never forget.